Getting a new dog or puppy is an exciting time for you and your family – congratulations! You’re bound to have questions about the best way to introduce your new dog, and to help them settle in to their new home quickly. Here’s our advice for welcoming a new dog or puppy to your home. While it’s always exciting to welcome a new puppy or dog to your family, it’s important to prepare properly for your new arrival. Follow our few simple tips and do things right from day one, to avoid behavioural problems in the future. A familiar smell will help your new puppy settle, so ask the breeder or rescue centre if you can take away with you a blanket or another (safe) item that smells like their old home. Adopting a dog is a big decision and before you commit, you should carefully consider your circumstances. 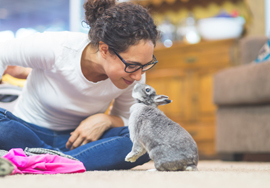 How well will you be able to meet your new pet’s needs? Dogs are sociable animals and creatures of habit. They learn through association, so a stable, predictable environment can help to settle a dog and reduce their stress levels. 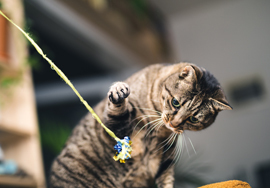 It is important to remember that you are welcoming an animal into your home that does not speak the same language as you – they will not immediately understand what it is you require of them. Remember, they have just been separated from their mother and siblings/previous owner, so will be feeling all sorts of emotions. Patience, along with positive, reward-based training is vital in helping your puppy settle in and develop into a well-adjusted adult that has a brilliant bond with its owner. Ideally, collect your new puppy/dog on a morning so they have the day with you to explore their new home and begin to adapt before bedtime. Bring your puppy into the home and allow them to explore each room in turn, primarily focussing on the room where you keep most of their resources – food/water bowls, toys, bedding, access to the garden etc… It’s important that the puppy knows where their belongings are where they can escape to if they’re worried (i.e. their bed). Calm and quiet behaviour from adults and children alike will help to reduce your puppy’s nerves. Leave them to explore in their own time but remain present so the puppy can come over to you if they need reassurance. If they seem reluctant to explore, gentle praise and encouragement can help. The key is to avoid rushing them. 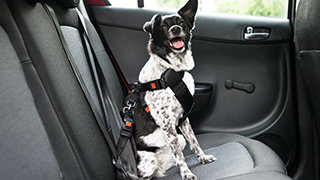 Allow your puppy all the time they need to adjust. Once your puppy seems settled and has had a good look around, you can start with your usual daily routine – regular toilet trips to the garden, feeding when it is due, playtime and of course, training! The puppy will settle better on their first night if they are sleepy. Understandably, young children will be excited to meet their new puppy but it’s important to explain to them the importance of staying calm around their new pet. Teaching your children to interact safely and appropriately with the puppy will help to avoid accidents in the future. Dogs and children can live together very happily but you must take extreme care. Teach them how to approach the puppy, how to stroke them calmly and safely; their enthusiasm can rub off on the puppy – and an overexcited dog may playfully scratch or nip. The best setup is to encourage the children to sit on the floor and allow the puppy to explore around them. No pulling hair, grabbing the pup or picking them up. Remember, they’ll be dealing with a lot of “firsts” in one day and may be worried! Allow your puppy to wander around in his/her own time. If they have had enough and no longer wish to interact, be sure to respect their decision and allow them to rest, or play alone with their toys. If you’re introducing a new dog or puppy to a home where they won’t be the only pet, the initial introductions will be slightly different. If your puppy is slightly older and fully vaccinated, we recommend taking them for a walk, along with your resident dog, so the pair can meet on mutual ground. They’ll likely be too distracted by all of the smells to notice each other too much. If you can’t do this, bring your new puppy into the home when your other dog is out on a walk. Allow the puppy time to have a look around, following all of the previous advice listed above. Then, when it’s time to bring in your other dog, remove any toys or chews – just in case the resident dog becomes defensive. Put your resident dog in the garden, where they’ll be able to smell the scent of the puppy and adjust to it. Bring out the puppy, on a lead if you think they might be too much for your older dog to cope with. Put the puppy on the floor and crouch alongside them. Reward any sniffing and positive interactions between the dogs. It’s best not to have food present in case they argue – you can introduce this at a later stage. For now, stick with verbal praise and strokes. Closely observe their behaviour and separate them if it gets too boisterous or if one dog appears concerned. If you need to separate them, you can distract them away from each other using your voice and praise. If you have multiple pets, it’s best to introduce your new puppy to each pet in phases, and to take time to introduce each other’s scent. Your vet will advise you on the best ways to do this. Always feed your new puppy or dog separately to other pets until they’re used to one another – and never leave pets together unattended until you’re confident that they’re secure and happy in each other’s company. As long as there’s no competition for food or a place to sleep, you should find your dog learns to tolerate other pets – and, in most cases, they’ll go on to become good friends. Your new dog will need time to discover and get used to your home and family. 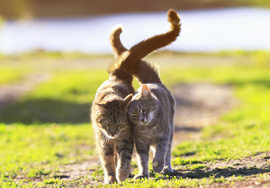 Making a gradual introduction is the best way to ensure a happy pet, and to avoid any future behavioural issues. Need more advice on introducing a new dog? For more information and advice on the best ways to introduce a new dog or puppy to your home, visit your local vet. Find your nearest recommended vet or pet clinic, use our Find a Vet page.